Pictured: A group of MD students in the Class of 2021 at their White Coat Ceremony in July, 2017. The John A. Burns School of Medicine (JABSOM) is among the top medical schools in the country in several key areas, according to newly released data from the Association of American Medical Colleges (AAMC). 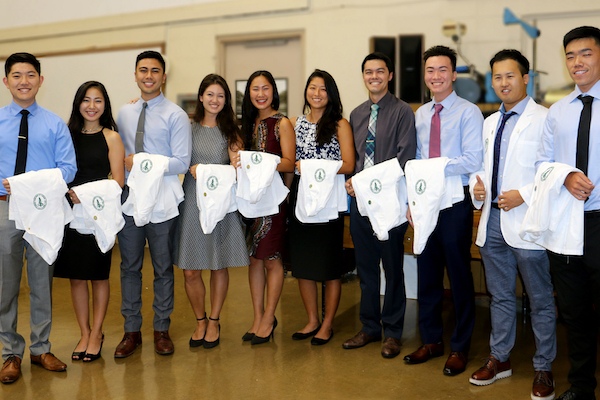 The University of Hawaii medical school excels in the number of its graduates who enter training in primary care medicine. JABSOM placed better than 90% of all other accredited medical schools in the percentage of students choosing primary care. This year U.S. News & World Report ranked JABSOM #23 in the nation for the percentage of its graduates who train in primary care. JABSOM also is very strong in retaining its graduates after training to practice in Hawaii, performing better than 75% of other medical schools in North America at generating its state’s own MD workforce. The results are impressive because JABSOM-trained MDs specializing in primary care who remain in Hawaii or return here after their postgraduate training are critically needed to stem the growing shortage of physicians in the Aloha State. “With Hawaii some 500 physicians short of the number it should have for its population, we are exceedingly pleased that JABSOM continues to show sustained growth in producing the kinds of doctors we need the most – those in primary care – and that a significant percentage of the doctors we train stay here in Hawaii to practice,” said Jerris R. Hedges, MD, Professor and Dean. Additionally, JABSOM is in the top 15% of medical schools whose graduates intend to care for underserved (poor or disadvantaged) patients. JABSOM also ranked near the top for its diversity among MD students and faculty and in providing learning experiences that include emphasis on cultural competency and health inequities. The AAMC data also shows value for Hawaii families. Almost nine out of ten JABSOM students are kamaaina, and come from middle-class families. The average JABSOM medical student graduates owing $161,550, above the national median of $150,000.